Round Thin-Wall Tube 1/4" OD x 1/8" ID x 6ft. 1/16" Wall. Extruded Clear Acrylic. 125- 6ft lengths per box. Shipping- Oversized charges apply. Cutting available at additional cost. Round Thin-Wall Tube 5/16" OD x 3/16" ID x 6ft. 1/16" Wall. Extruded Clear Acrylic. 36 - 6ft lengths per box. Shipping- Oversized charges apply. Cutting available at additional cost. Round Thin-Wall Tube 1/2" OD x 3/8" ID x 6ft. 1/16" Wall. Extruded Clear Acrylic. 35- 6ft lengths per box. Shipping- Oversized charges apply. Cutting available at additional cost. Round Tube 1/2" OD x 1/4" ID x 6ft. 1/8" Wall. Extruded Clear Acrylic. 35- 6ft lengths per box. Shipping- Oversized charges apply. Cutting available at additional cost. Round Tube 1/2" OD x 3/16" ID x 6ft. 5/32" Wall. Extruded Clear Acrylic. 35- 6ft lengths per box. Shipping- Oversized charges apply. Cutting available at additional cost. 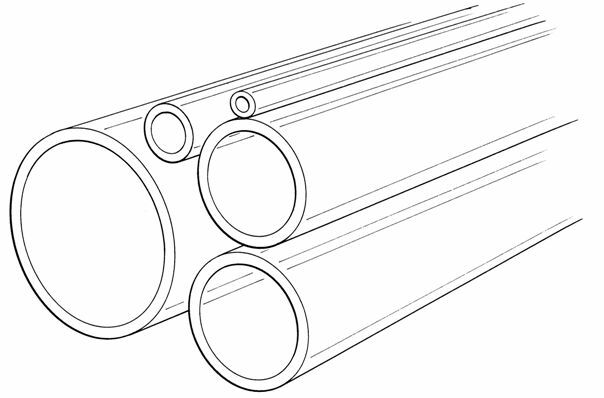 Round Thin-Wall Tube 5/8" OD x 1/2" ID x 6ft.1/16" Wall. Extruded Clear Acrylic. 20- 6ft lengths per box. Shipping- Oversized charges apply. Cutting available at additional cost. Round Tube 5/8" OD x 3/8" ID x 6ft. 1/8" Wall. Extruded Clear Acrylic. 20- 6ft lengths per box. Shipping- Oversized charges apply. Cutting available at additional cost. Round Thin-Wall Tube 3/4" OD x 5/8" ID x 6ft. 1/16" Wall. Extruded Clear Acrylic. 50- 6ft lengths per box. Shipping- Oversized charges apply. Cutting available at additional cost.